Sarah Nader- snader@shawmedia.com Laurie Peceny (left) of Crystal Lake, Marilyn Hess of Crystal Lake and Pat Gedzyk of Crystal Lake talk with Democratic Party candidates Melissa Coyne, candidate for IL Senate District 32 and Lynn Gray, candidate for Recorder of Deeds Thursday, April 21, 2016 in Crystal Lake. The candidates were asking residents to sign a petition to have their name on the ballet in November. 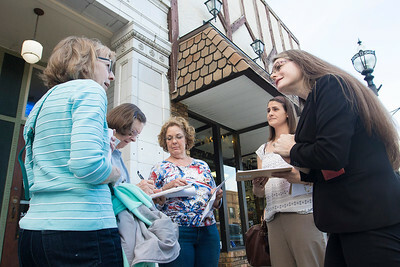 Sarah Nader- snader@shawmedia.com Democratic Party candidate Lynn Gray (right), waits by while Colleen Sullivan of Lake in the Hills signs a petition for Gray to get her name on the ballet in November in Crystal Lake Thursday, April 21, 2016. 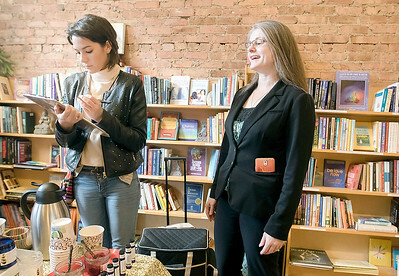 Sarah Nader- snader@shawmedia.com Democratic Party candidates Lynn Gray (left), candidate for Recorder of Deeds and Melissa Coyne, candidate for IL Senate District 32 leave a store Thursday, April 21, 2016 in Crystal Lake. The candidates were asking residents attending Spring Ladies Night Out to sign a petition to have their name on the ballet in November. 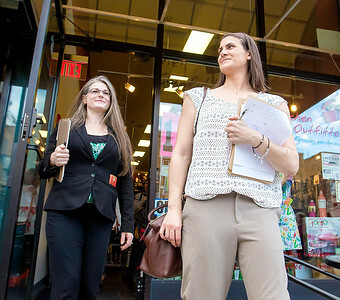 Democratic Party candidates Lynn Gray (left), candidate for Recorder of Deeds and Melissa Coyne, candidate for IL Senate District 32 leave a store Thursday, April 21, 2016 in Crystal Lake. The candidates were asking residents attending Spring Ladies Night Out to sign a petition to have their name on the ballet in November.